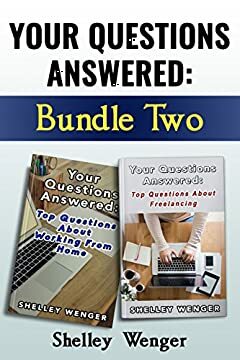 If you have ever wanted to work from home as a freelancer, Your Questions Answered Bundle Two is the perfect place to start. It contains two books filled with answers to many questions that you are worried about. Can You Really Work From Home Full Time? In Your Questions Answered: Top Questions About Freelancing you will find an abundance of information, all geared to helping you decide if this is the right job for. Shelley Wenger is a professional freelancer and has worked from home for many years. She has a wealth of knowledge on the subject and her book goes into great detail about every aspect of what it means to work from home as a freelancer in todayâ€™s world. Get a copy of Your Questions Answered: Bundle Two now. It could be the catalyst youâ€™ve been looking for, to give you the courage to step out into a new career!